Now that you have your CAN (Catch-All-Notebook), it’s time to start filling out the pages. This is the fun part that is going to set you on your way to the life you’ve only dreamed about. Sit down with your CAN. Put the date at the top and list all of the things that are important to you. You probably think about these every once in a while, but it’s doubtful that most of us have written them down. And they’ve probably changed over the last few years. (Don’t worry. They’ll change again in the next few.) Don’t feel embarrassed about your values. It’s okay to value a career AND family. This won’t work if you aren’t honest with yourself. Here are some examples if you feel stuck. Now pick out the top 3-5 of the values that are most important to you. This doesn’t mean that the others aren’t important; it just means this is where you currently are in your life. For example, family is important to me, but my career is a priority right now. My relationship with my family is really good, but I really need a new job. This puts career as one of the top priorities of my values. After looking at your prioritized values, write down 10 goals that you want to accomplish this year regardless of obstacles in your life such as money. While it’s important to obtain your dreams, it’s just as important to be realistic. You’re not going to lose 50 pounds in a week or get a bachelor’s degree in a year when you haven’t stepped foot into the university yet. 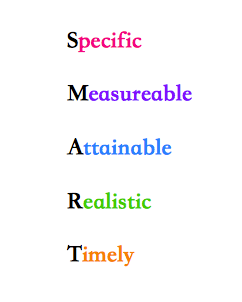 Your goals must be SMART. Chalene Johnson is one of my favorite fitness celebrities. She’s a self-made millionaire, and she has been changing lives and bodies for years. In her book Push: 30 Days to Turbocharged Habits, A Bangin’ Body, and the Life You Deserve, she suggests that you write your goals in the present tense as if they are currently achieved. For example, instead of writing I will lose 20 pounds in 6 months, you would write I weigh 125 pounds and looked amazing at my high school reunion. Chalene also suggests that one of your goals be a health/fitness related goal. I developed the concept of the Push goal after 15 years of working as a coach and business advisor. It was my response to a tendency I’d observed in even the most goal-oriented individuals: After they’d set their 10 personal goals for the year, they often didn’t know which goal to tackle first. So generally, they’d start with the easiest to accomplish. Just one problem: The easiest goal tended to result in the least rewarding outcome, which diminished their personal mojo. I saw people losing motivation and interest, even when their top 10 goals were in writing. To identify the problem, I analyzed my clients’ lists of goals—and noticed that there was always one goal which, once achieved, would make possible or “push through” the other goals. Voilà! The Push goal was born. Johnson, Chalene (2011-12-14). PUSH: 30 Days to Turbocharged Habits, a Bangin’ Body, and the Life You Deserve! (Kindle Locations 596-602). Rodale. Kindle Edition. So here is a list of my goals and how I came about identifying my own PUSH goal. My house is organized in every room, drawer, closet, and cabinet. My blog has 30,000 followers. I have a job that I love with benefits and nothing less than a $60,000 income. I took a vacation with my family to Hawaii. I am 25 pounds thinner. I have $1000 in emergency savings and have paid off $6000 in debt. I work out in some form every day of the week. I have received my CES, FNS, and Pi-Yo certifications. I completed my first novel. I surprise my husband and son with little date nights. I’m going to give Chalene the credit for the reverse engineering of the goals, but I have to give myself kudos, as well, since I’ve been doing this for years. 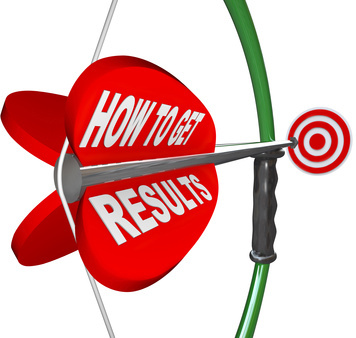 She has 3 steps to follow to reverse engineer your PUSH goal. A. In your CAN, create a “brain dump.” Write down everything that deals with your PUSH goal: what you need to do, procure, research, master, etc. that has to do with accomplishing your goal. B. Every step should take no more than one day to do. If it will take longer, you need to break it down into smaller steps. Follow the same steps above for your fitness goal. You’ve done a lot already today. Really take some time to create these goals and think about all the tasks you need to do in order to accomplish your PUSH goal and your fitness goal. Tomorrow I’m going to show you what to do with all the information you’ve written down in your CAN. Good luck and happy brainstorming!